View More In Photobooth Props. 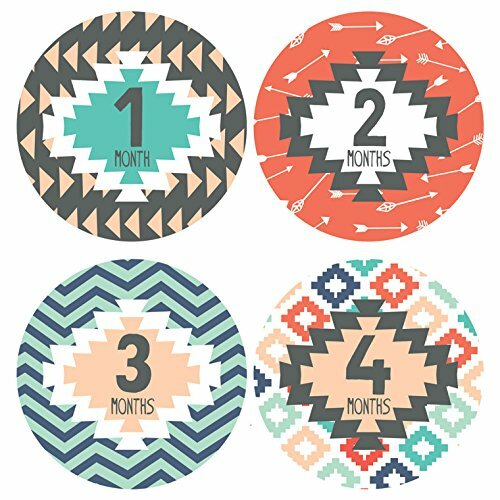 12 monthly bodysuit stickers for your baby girl or boy. Each sticker measures 4 inches across and will be the perfect accessory for your monthly photos. Just stick onto any clothing and presto! These make the perfect baby shower gift and will help any mommy remember their first year in a very special way! Everyone loves to see monthly photos, and now you have a great way to let everyone know how old your little one is. These stickers are nicely packaged for gift giving and come in sturdy packaging to ensure nothing gets bent or wrinkled. Your satisfaction is our promise, and we are determined that you are happy with our product. If for any reason you are not, you can return your stickers for a refund. We know you will love them and the special memories you will make with our monthly bodysuit baby stickers. If you have any questions about this product by Lucy Darling, contact us by completing and submitting the form below. If you are looking for a specif part number, please include it with your message.